Flat bread is one of my favorite appetizers, but during the hot summer days the last thing I want to do is turn on the oven and heat up the house. 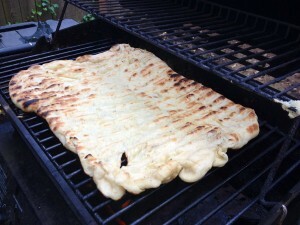 Luckily, flat bread can easily be made on the grill and, in my opinion, it actually tastes better that way (especially when it means that my house stays cool!). This recipe uses my favorite Mediterranean ingredients combined with the Falafel Sunshine Burger, however, feel free to use this recipe as a template for your own favorite summer ingredients! Roll out the dough until it is flat and shaped like an oval or square. Spread a drizzle of olive oil on both sides of the pizza dough and spread the olive oil so both sides of the dough are completely covered in a light coat of oil. Heat the grill to medium heat (if using a gas grill) and place the raw dough directly on to the grill. Flip the dough with a metal spatula when the bottom of the crust is firm and grill marks begin to show. Then layer on the toppings: first 1/2 of the garlic, then the cheese, artichokes, olives, and tomato. Then put on the Sunshine Burger crumbles and remaining garlic. Close the lid of the grill and let the pizza cook until the cheese begins to melt, talking care not to let the bottom of the crust burn. Remove the pizza from the grill and let the pizza cool for several minutes. 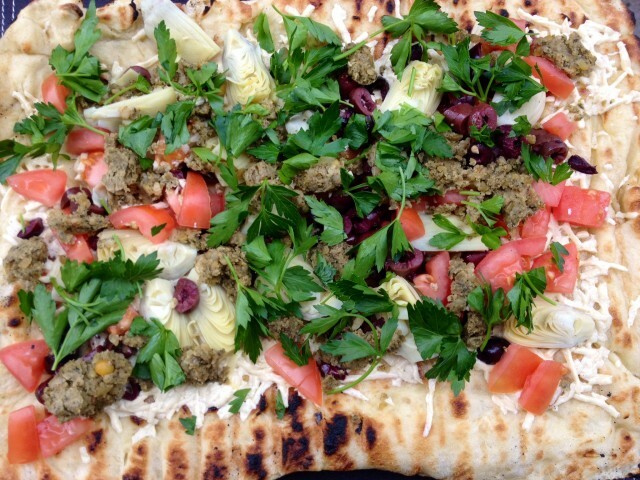 Top the pizza with the chopped parsley, cut the flatbread into squares, and enjoy al fresco with friends! This recipe works best on a clean and oiled grill, for some tips on how to do that check this out. 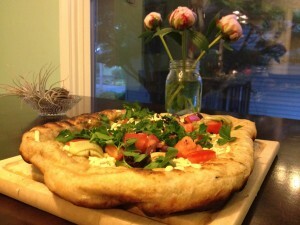 My husband and I used the olive oil method on our grill for this recipe.